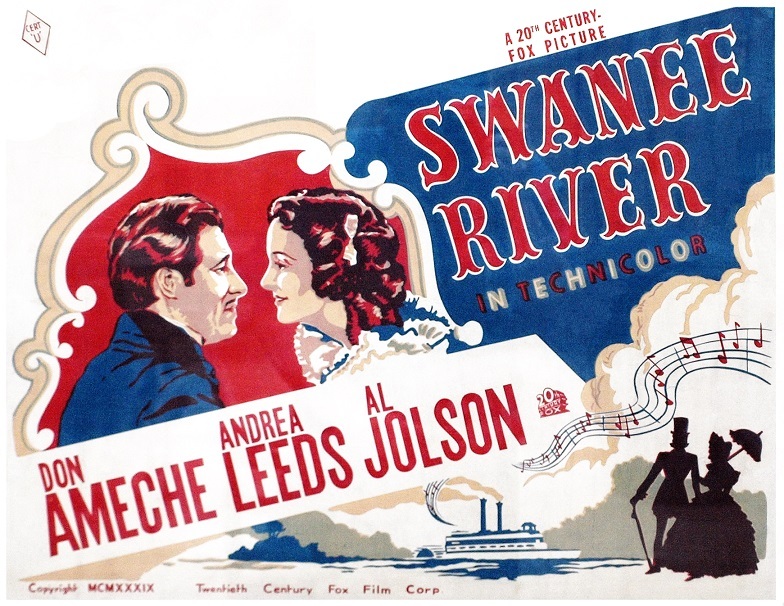 SWANEE RIVER 1939 20th Century Fox "biopic" of Stephen Foster starred Don Ameche. 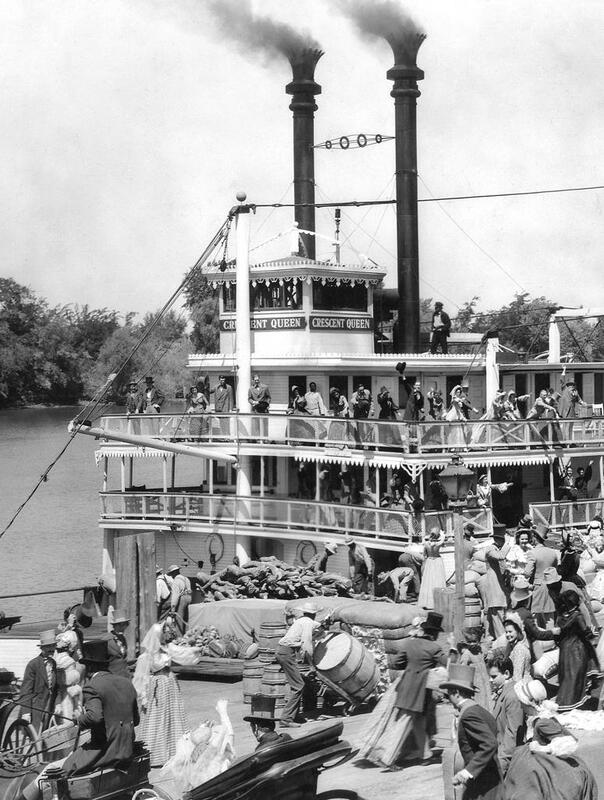 The CAPTAIN WEBER was remodeled to play the "CRESCENT QUEEN" on the Sacramento River. From 20th Century Fox Cinema Archives DVD available from amazon.com. This is scanned from a framed 11x14 still that turned up during some remodeling here at home. 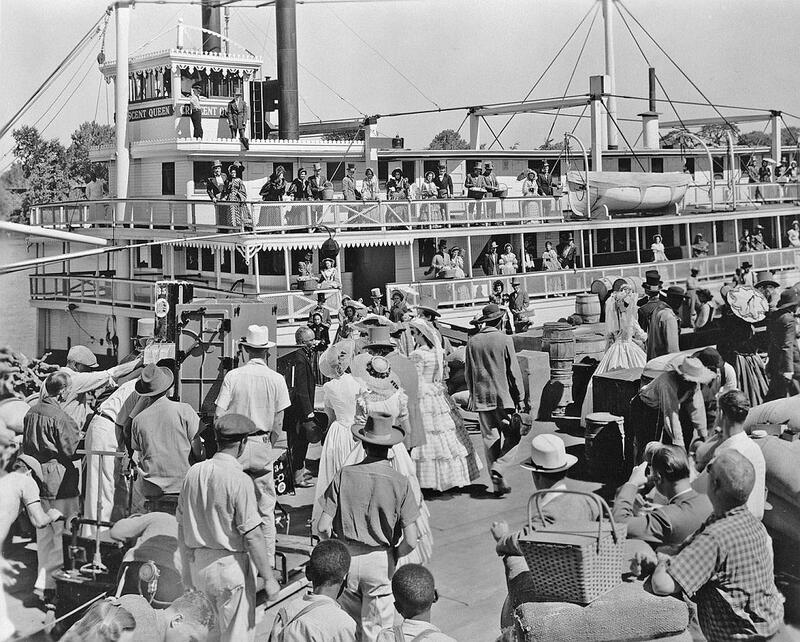 You already have a smaller scan of a production shot with the Technicolor camera from when this scene was being filmed up on the Sacramento with the CAPTAIN WEBER made up as the CRESCENT QUEEN. 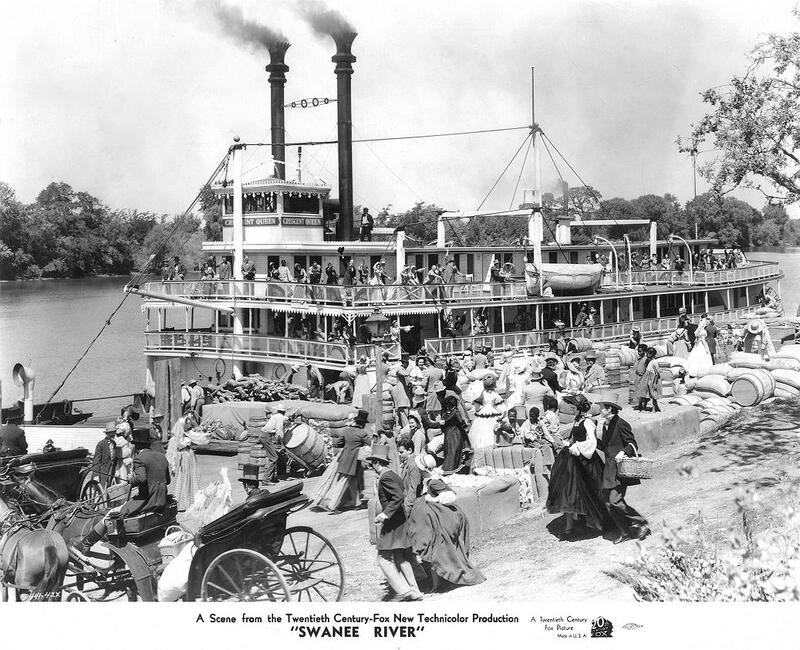 SWANEE RIVER (20th Century Fox, released January 1940) was one of several movie musical "biopics" based on the life of Stephen Foster who wrote the GLENDY BURKE about the steamboat GLEN D. BURKE that we have original sheet music for in our museum. Footage from this steamboat sequence was also used in the 1952 Warner Bros. biopic about Jim Bowie starring Alan Ladd as the man who improved on the design of the American hunting and fighting knife which was sometimes referred to as "The Arkansas Toothpick." REPLACEMENT THE LAST PHOTO ON MOVIES 1 IS A STILL FROM SWANEE RIVER OF THE CAPTAIN WEBER AS THE "CRESCENT QUEEN." ATTACHED AN UPGRADE OF THAT IMAGE AND A DETAIL FROM IT IN A VERTICAL FORMAT. 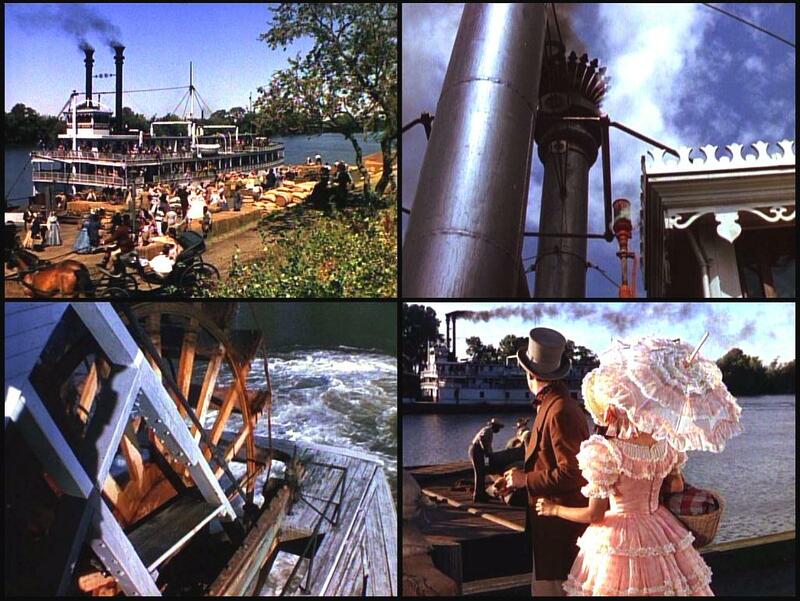 IN ADDITION TO THESE YOU HAVE 4 COLOR FRAME CAPTURES FROM THE MOVIE AND A PRODUCTION SHOT OF THE TECHNICOLOR CAMERA WITH ACTORS AND CREW IN FRONT OF THE "CRESCENT QUEEN." U.K. HALF SHEET SILK SCREENED POSTER FOR "SWANEE RIVER." RATED "U" IN GREAT BRITAIN, MEANING "UNIVERSAL" (SUITABLE FOR ALL AUDIENCES). COPYRIGHT 1939 (IN ROMAN NUMERALS). This is a photo of Don Ameche as Stephen Foster in the 1940 20th Century Fox "bio-pic" SWANEER RIVER. Here circa the late 1840's Foster lounges on an Ohio River wharf listening to the work songs of the African American roustabouts as they roll cargo which will be loaded aboard a steamboat. Ameche here is so absorbed with the voices of the workers that he forgets to meet his fiance for an excursion boat trip on the CAPTAIN WEBER (as the "CRESCENT QUEEN") which we have a photo of among our Steamboats in the Movies photographs. Foster was influenced by folk music when he composed songs that were often performed in black face Minstrel shows. We have the sheet music in our museum here of DE GLENDY BURKE (dedicated to the steamboat GLEN D. BURKE) and many other songs and melodies created a timeless soundtrack of the antebellum South. One of the great "anthems" Foster wrote was RING, RING DE BANJO. Ever popular and familiar songs to us still are OH SUSANNAH, CAMPTOWN RACES, MY OLD KENTUCKY HOME, NELLY BLY, OLD BLACK JOE & MASSA'S IN DE COLD, COLD GROUND. The old black dialect in the originals became politically incorrect and the lyrics are often rewritten to a more neutral American dialect. One of Foster's songs which has had a tremendous revival is HARD TIMES COME AGAIN NO MORE, which has been recorded again by singer/musicians of the folk song community, gospel and other popular genres. HARD TIMES manages to address poverty and homelessness with genuine emotion and empathy and without corny sentimentality. 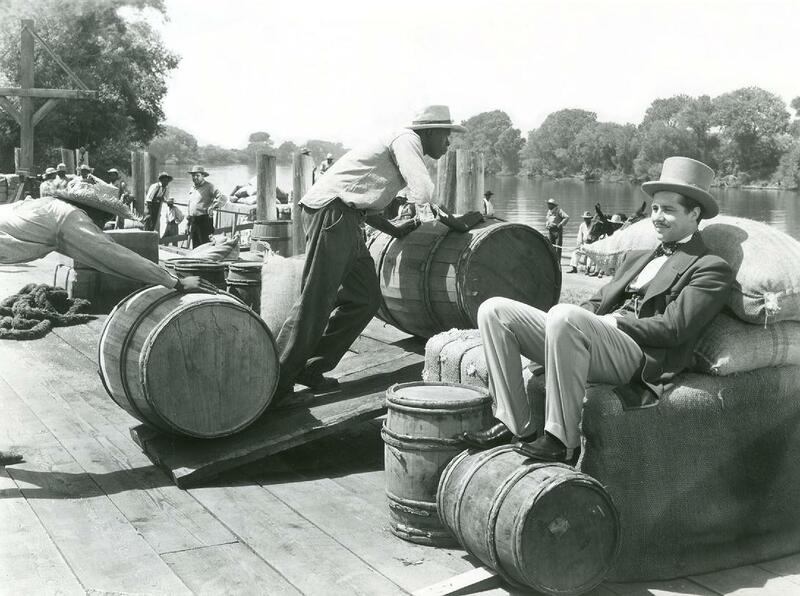 Up on the Sacramento River the CAPTAIN WEBER played the "Crescent Queen" in the 1939 20th Century Fox film SWANEE RIVER (based on the life story of composter Stephen Foster who was played by Don Ameche).